Dawn is a troublemaker, a bleeding heart, a designer by trade and a do-gooder by choice. Two things she likes: ideas and people. She’s been known to put them together in a room, just to see what happens. She started Firebelly in 1999 with a simple mission: Good Design for Good Reason™. Since then, she’s been diligent about hiring passionate overachievers, seeking out fearless allies and taking on projects with the potential to uplift communities and maybe even change the world. While she’s kept the team intentionally small, Dawn's kept hustling to expand Firebelly’s reach and impact. In the studio alone, she's established and housed a community nonprofit, a start-up incubator and a 10-day design bootcamp. She also co-founded Typeforce, an annual exhibit and celebration of Chicago's type community, in partnership with Public Media Institute. And then there's the Grant for Good, started in 2003, which provides a full year of free, comprehensive design services to a local nonprofit. She’s hyperactive beyond the studio as well, preaching the gospel of good design in venues near and far. She’s spoken at the School of Visual Arts and the Type Director’s Club, appeared as a guest on the Design Matters podcast and gotten vulnerable on the triumphs and tribulations of social impact design in print and in person for audiences big and small. Named one of Fast Company’s 11 Most Generous Designers, Dawn leads with love, keeps a close eye on her people and believes that we truly are in this together. 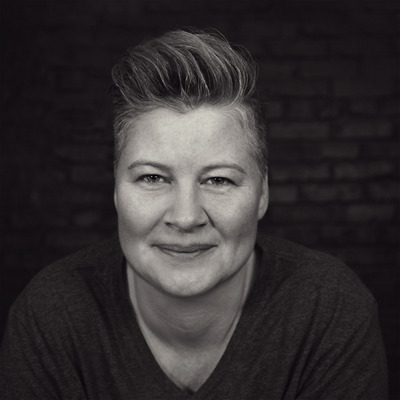 together, Dawn holds a BFA in Visual Communication from Northern Illinois University and is a current board member of The Type Directors Club.